People tend to think of rabbits and guinea pigs as one and the same thing but, in actual fact, their needs and behaviours are very different. Pairing the two in a hutch or run is often disastrous and needs to be attempted with caution, if it is attempted at all. A rabbit’s best companion is another friendly rabbit. A guinea pig’s best companion is another friendly guinea pig. 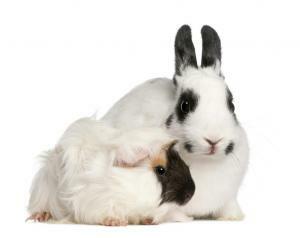 Keeping rabbits and guinea pigs together is not an ideal combination – RSPCA. In the past, rabbits and guinea pigs were kept together for companionship when neutering bunnies was considered unsafe. Nowadays, fixing a rabbit is the norm, meaning you don’t have to substitute a rabbit playmate for a guinea pig anymore. Housing the two together can be dangerous, especially in close quarters. If you’re not careful, it can also be detrimental to happiness and health as rabbits and guinea pigs have very different needs. The dietary needs of rabbits and guinea pigs are very different so they should really be fed separately. While guinea pigs need a diet that is rich in Vitamin C, rabbits can synthesise this a lot better and will become ill if they are exposed to too much of it. When a rabbit and a guinea pig live together, it can be tempting to fill up a bowl of food and leave it there for them to share. By doing this, you are only catering to one of their dietary needs and have no way of knowing who is eating what. Rabbits are also notorious for bullying guinea pigs away from the food bowl, preventing them from getting the nourishment they need. Bullying is a big problem when these two animals co-habit. Rabbits are both bigger and stronger than guinea pigs and will ‘throw their weight around’ if you like. This isn’t just evident at mealtimes but all the time, especially if it’s a one-to-one arrangement. Guinea pigs can easily become stressed and will look for places to hide away. It is important to provide for this with a house or shelter that has an entrance big enough for guinea pigs to enter, but not rabbits. If you see your guinea pig being bullied or notice it is losing condition or weight, separate the pair quickly. Communication is very different for rabbits and guinea pigs and both can get lonely and frustrated without their own kind. Humans and apes don’t communicate the same way, so why should we expect rabbits and guinea pigs to? As already touched upon, rabbits are bigger and stronger than guinea pigs and can inadvertently cause injury to smaller friends. When rabbits move, they kick out with their strong back legs; if a guinea pig happens to be there when this happens, serious injury can occur. Rabbits also have very sharp claws which, if they wrongly strike a guinea pig’s face, can cause corneal ulcers, blindness and infection. It is not unheard of for rabbits to also try and mate with guinea pigs, something which, again, can cause serious injury to the back and could even result in death. Rabbits (and cats and dogs) carry Bordetella bronchiseptica, a bacterium that infects their respiratory tracts and can easily be passed to guinea pigs. The bacterium usually persists in the environment so is better spread when two animals are in close proximity. The space and exercise needs of rabbits and guinea pigs are different so it is best to choose an enclosure that is large enough to facilitate a rabbit’s need to hop, skip and jump! In the wild, rabbits can cover the equivalent of 30 tennis courts every day, whereas guinea pigs have short legs that won't carry them as far. A space that is too cramped for a rabbit/guinea pig pairing will promote bullying and will make injuries more probable. That is not to say that rabbits and guinea pigs should be separated if they are already housed together and have an established friendship. Some pairings do work, and breaking them apart can cause more problems than it solves. If the enclosure is big enough or your pets range freely, rabbits and guinea pigs can co-habit with fewer problems. In fact, I have heard of them living side-by-side quite happily, alongside chickens and ducks as well. However, the RSPCA's advice is to keep rabbits and guinea pigs separate. Be sensible and if you suspect a problem with the housing arrangement, it is best to keep your pets apart. For all small animal products, including hay, treats, bedding and toys, have a browse through our wide range of items. I have run a piggy sanctuary for very many years and have taken in several piggies who have been hurt by being kept with rabbits so I was delighted to read your article. I have tried to educate people on the dangers of keeping piggies with rabbits and I hope that your article reaches a wider audience. Their nutritional needs are so different but people seem to think that a bowl of rabbit mix is sufficient for both animals. A piggy needs a friend who is also a piggy. A rabbit needs a rabbit companion. Thanks for writing your excellent post.